More recently I have been knitting afghans for gifts. I like to knit in the evenings, usually while we watch a movie or something on television. And I like simple patterns that I can remember after a few rows and mostly knit without having to constantly look at what I am knitting… like this “feather and fan,” which has only four rows that are repeated over and over again. I don’t have an actual pattern for this afghan… I just use a multiple of the feather and fan pattern stitches to make the size afghan I want. I start with six rows of garter stitch for the top border and end with six rows of garter stitch for the bottom border. Row 1: Knit (this will be the right side of the afghan). Row 2: Purl all the way across row. Row 3: * (Knit 2 together) 3 times, (yarn over, knit 1) 6 times, (knit 2 together) 3 times, repeat from * across row. Row 4: Knit all the way across row. Repeat rows 1 through 4 until the afghan measures desired length, ending with row 2 of the pattern stitch. This pattern is often made in three or more panels that are sewn together, but I prefer to make this afghan as a solid piece, repeating the pattern sequence to make the afghan as wide as I want it to be. Using size 10 1/2 or size 11 circular needles and worsted weight yarn, the “feather and fan” pattern makes up quickly, even in the out-sized afghans I like to make. 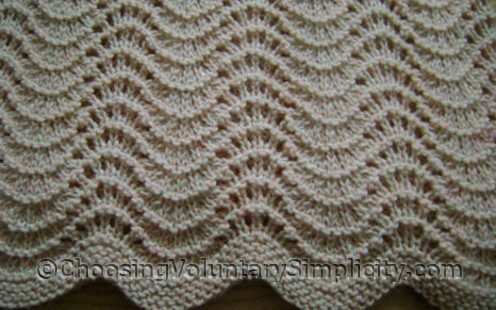 This pattern automatically makes a rippled edge on both ends of the afghan. But the afghans that were the most fun to knit were the ones made with the ombre yarns… I love watching the different color patterns that develop as I knit. 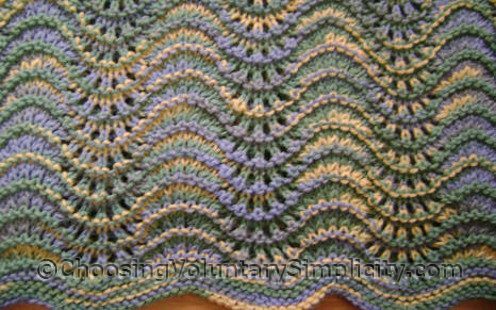 Another time I will show some of the other afghans I have knitted in other patterns… an all-over basket weave, a double cable, and a “mock cable” that actually requires more “thinking” than a regular cable does. I just finished putting a thick fringe on an afghan made in a cable stitch and with my same favorite off-white super-soft wool. That makes sixteen afghans I have knitted over the past few years. I think it is time for me to start knitting something else! Wow! These are seriously beautiful. I would so love to be able to make something like this. beautiful! you make me want to pull out my knitting needles again. I just wanted to ask do you sell any of your work? it looked amazing here I can only imagine in person and just thought what a perfect marriage so to speak of doing what you love and then getting financial gain from it.No intent to offend I just know I would be interested in purchasing and thought I would ask.Thank you for the beautiful pictures, enjoyed reading also how your knitting came about. Very very nice. You are a talented lady. I’ve always loved the feather and fan pattern. Lace patterns are my obsession in knitting, and I love to experiment with them, but when I want both lacy and simple, I always return to that one. It’s simple and elegant at the same time. I just learned to knit a couple years ago and I like doing the fun stuff like entrelac and LOVE knitting socks. Your afghans are beautiful. Thank you for sharing! Pam, I have not tried to sell any of my work, but thank you for the interest. 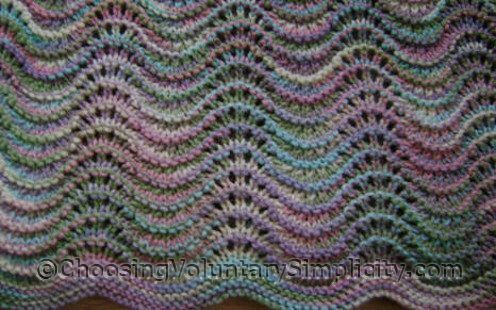 I have been looking for a feather and fan pattern to make a prayer shawl for my cousin who has been fighting non-Hodgkins Lymphoma for years. At this time, she is scheduled to have a bone marrow transplant. Thank you Shirley for sharing your beautiful pattern. God Bless. Thank you for sharing the fan and feather pattern. I enjoyed seeing how they made up in the different color yarns. I am on break for the holidays and learning this stitch is my goal for the New Year. I do lots of knitting for church and the community and am anxious to add this to my patterns. I adapted this for a wrap, casting on 54 stitches (18 x 3). To help keep track of the stitch sequence in the third row, I placed a marker every 18 stitches. That way, I won’t get off track and have to rip out (not my favorite thing at all!). Mary, I’ve always just let the color pattern make itself. To me, that is the beauty of ombre yarn. Years ago I knitted a Feather and Fan afghan for a grandson and his bride, and one for a friend’s daughter. I just recently began knitting them again. I’d forgotten how relaxing the pattern is to knit, and how beautiful the finished product is. As soon as I finished the most recent one, I immediately cast on for another. It’s such a nice surprise to find someone else who enjoys knitting these afghans. When I told some of my knitting friends that I was going to knit an afghan, they all agreed that I was crazy. I like knitting them from an off-white yarn. I agree with you. This is the most beautiful and easiest of patterns ever.